Since it's National Nutrition Month, we thought it would be fun to ask our lovely dietitians here at the DAHLC about what kinds of foods they enjoy. 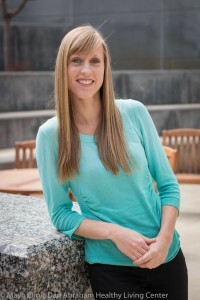 Read on to see how one of our dietitians, Kristen, answered the questions! What is your go-to post-workout snack? Any tricks that you learned that are helpful with preparing healthy foods? I always have fresh fruits and veggies washed and prepared in my crisper for quick snacks and additions to meals. What are 3 things that you always have in your kitchen/ pantry? Thank you so much for sharing with us, Kristen!